This is the 39th year for the event which is one of the five Zone 1 level annual events. This fun weekend is based at the Hilton Garden Inn, Huntington, Long Island and is co-hosted Metro New York region. It kicks off with a Friday evening reception, followed by a Gimmick Rally on the Saturday and the Concours d’Elegance that will be held in the wonderful setting of the Vanderbilt Museum, Centerport. Sounds like a perfect summer weekend. June 29th – when reservations for rooms at the host hotel must be made to get the PCA rate. July 1st – when we need a reasonable estimate of attendance for planning. 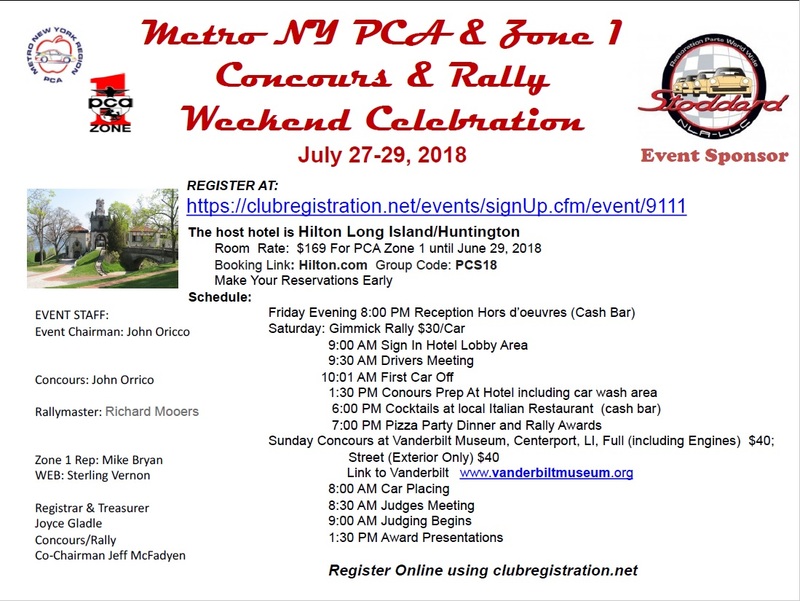 The Host Hotel is the Hilton Long Island/Huntington Long Island reservations can be made at hilton.com PCA Group code PCS18, room rate is $169. The Concours site is the spectacular Vanderbilt Mansion and Museum at Centerport, Long Island on the Long Island Sound waterfront.